Facebook launched a new feature yesterday, Facebook Places, that's lets you "check-in" at a location, using the built-in GPS on your cell phone, to let your friends know where you are. Given all of our past privacy concerns with Facebook, should you check-in or opt-out of Facebook Places? Facebook Places uses GPS on your iPhone (and soon Android phones) to determine your location, and then finds a list of places (for instance, a restaurant, bar or even a playground) nearby. You can then "check-in" to one of these places to let your friends know where you are. Your location is updated on your Facebook status page and will be visible to everyone who has access to your Facebook Recent Activity. When you check in, you can also tag Facebook friends who are with you. Facebook Places also has a "People Here Now" section, where you can see others who are checked in at the same location—helpful if you want to meet up with other families at the park or find friends who are attending the same music or sports event. Unlike your normal status updates, your status in "People Here Now" is visible to everyone checked-in to that location. If you're not comfortable with that, you can opt-out by unchecking the "Include me in 'People Here Now' after I check in" your privacy controls. Hopefully, Facebook will improve this feature to limit "People Here Now" to friends-only, if you choose. It's important to realize that no one will know where you are or be able to track you unless you check yourself in or your friends check you in. But you receive a notice if you are checked-in by a friend allowing you to "check-out. You can also prevent any friends from being able to check you in, and we'll cover that in the privacy control section below. Facebook Places uses a new version of the Facebook app, which you must download to your iPhone. If you are using an Android phone that supports HTML 5 and geolocation (most of the newer phones do), you can also get to Facebook Places using you mobile browser at touch.facebook.com. Facebook Places is only available in the United States and is slowly rolling out to all US users, but Facebook says they expect to make it available to more countries soon. Location-based services like Facebook Places (Foursquare and Gowalla are the other big players) allow you to find friends who may be in the same location. This is very helpful for impromptu get-togethers, especially in large areas where it is hard to see who might be there. I can definitely see using this myself when at the zoo or museum with the kids to see which of their friends may be there. What is equally interesting, is that businesses are able to use location-based services to offer special coupons and deals. So next time you check into your local Starbucks, a coupon could pop up offering you $1 off your latté. Or they might award a special prize, such as reserved seating, to their most frequent customers. Facebook Places isn't offering this yet, but they almost certainly will be soon. Its main competitor, Foursquare, already is. We've complained about Facebook's automatic "opt-in" policies for new features in the past. Like these past feature, Facebook Places is also automatically set to "opt-in". However, with Facebook Places, your location is never revealed unless you check-in to tell Facebook where you are or one of your friends checks you in. Now, depending on how much you trust your friends' judgment, you may not be comfortable having them check you in. Especially, since doing so will reveal your location to anyone who can view their status updates, as well as adding you to that location's "People Here Now". I recommend that you turn this feature off. You may also want to limit who can see your location check-ins to friends and turn off the "People Here Now" feature, so that only people you trust will know where you are. I recommend that you do this also, as there have been real cases of criminal groups using location services to burglarize homes when they know people are away. But keep in mind that doing so will make it more difficult for friends to find you as well. Go to your Privacy Settings in Facebook. Under "Things I share", set the "Places I check in to" option to "Friends only"
Under "Things I share", uncheck the box next to "Include me in "People Here Now" after I check in"
Under "Things others share", change the setting of "Let Friends Check Me In" to "Disabled". 1) It’s on by default and my friends can “check me in”. 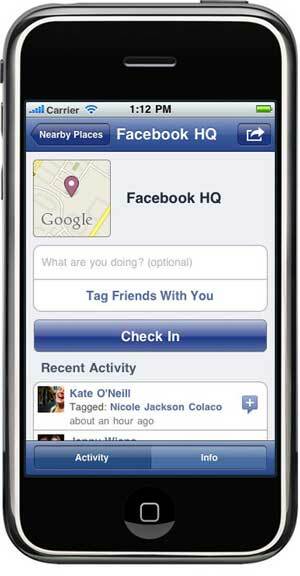 2) Unlike Gowalla and Foursquare, Facebook has access to a lot more information that just my location. Those two things alone is why I immediately disabled the feature on my facebook account. I use a number of tools to help protect my facebook account.